Comprehensive, one-on-one telephone & internet instruction OR LIVE right here in El Paso, Texas OR Home Study. 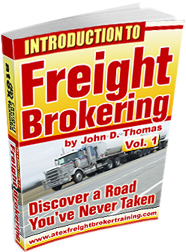 A sample business plan based in part upon John’s actual freight broker business. This business plan is sent in MSWord format to enable you to go into it, modify it and make it your own. Templates for both a 12 month and 5 year cash flow statements. Load Manager spreadsheets (developed by John) to manage and evaluate your load activity from the time you take the order until the time you receive payment for each load. (With these, you won’t need to buy expensive software). Database templates ready to use for both shippers and motor carriers. Video presentations on about 30 of these handouts that you can view over and over again. The biggest benefit of training one-on-one via the telephone and Internet or live with unlimited support is the fact that you get input for your questions REAL time. Input that is based upon my most recent training activity and input that is based upon YOUR current situation and needs. The training manual is an “exe” file. All other materials are emailed to you in either MSWord, MSExcel or PDF format. After processing your order, John will call you to set up a flexible training schedule – and you begin, usually with your applications for your broker authority after you have your company registered. It’s that simple. The Home Study program includes everything listed here along with three-months of email Q&A support. Recently, a low-cost program has been completed that has all the content as the other options except for some of the handouts. The Home Study and the Low-Cost options may be the best values of all.